Uganda’s long distance runner Solomon Mutai won another medal for team Uganda at the on going Commonwealth games in Gold Coast, Australia. The 26 year old was taking part in his second Commonwealth games after participating in the 2014 edition that was in Glasgow, Scotland. After finishing fourth in Scotland, Mutai born in Bukwo went two better this time round as he bagged a silver in the Marathon. 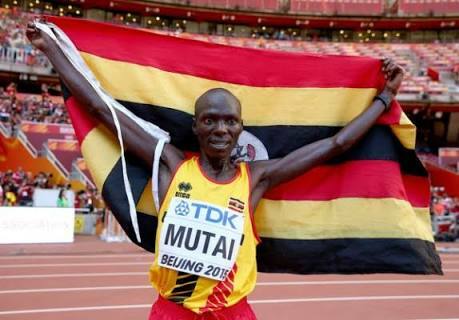 Mutai has now won two medals in International events after the Bronze he won at the 2015 World Championships in Beijing, China. Uganda’s tally of medals moves to six at this year’s championships including three golds, one silver and bronze. The golds belong to Josua Cheptegei (2) in both the 5,000 and 10, 000 meters for the men and Stella Chesanga who won the women 10,000 meters event. Boxer Juma Miiro and runner Mercyline Chelangat won bronze medals in their respective events. Although the Seven’s Rugby team is in action later on Sunday, it is highly expected that the final tally of medals will remain at six as it will be a miracle of sorts if they(Rugby Sevens team) win anything. Six is the best tally that the nation has achieved since Christchurch, New Zealand in 1974 when Uganda won a total of 9 medals. Despite the tally being impressive, it is level with the six Uganda won in Perth 1962 and one less than the seven in Edinburgh 1970. The last games in Scotland saw us win a total of five medals, including one gold and four Bronze. Uganda will most likely finish 14th in the games out of the 71 nations that took part this year.